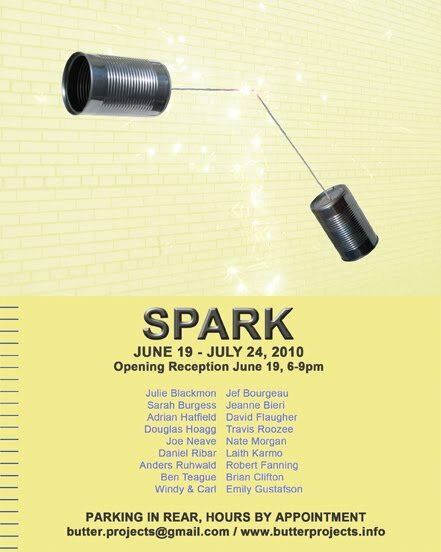 Please join us for the opening reception for SPARK! Saturday, June 19th, 6-9pm. The theme of SPARK is collaboration. We've selected works from 9 artists and matched them up with 9 additional artists, who will then create a piece in response. With this exhibition, our hopes are to create dialogue between the two works and ultimately the two artists. In a way, we are forcing a collaboration and sparking a connection between two things that otherwise might not be possible. Many works will be available for sale (cash or check). BUTTER is located at 814 West 11 Mile in Royal Oak, MI, 48067. Parking is available behind the building. What an exciting concept. Can't wait to see what everyone comes up with. I am so happy to be able to watch from a far all of the workings of butter.